Tuna is an incredibly versatile protein and can be swapped for other proteins. It works well in many of your favorite recipes and can be a great way to lower the fat and cholesterol and add those heart healthy omega-3's to your favorite recipes. Tuna is also a great way to "mix it up" a bit! It's a nice way to jazz up your recipes and add some fun flavors to your favorite dishes. We've shown you some examples of how the nutritional profiles* and flavors change with some of our favorite recipes. Now it's your turn! Share your favorite alTUNAtives with us – we love to see your creativity! Recipe based on comparison of tuna and 10% lean ground beef, pan browned. Nutritional comparisons are done using the same recipe only with the tuna swapped for the alternate protein. 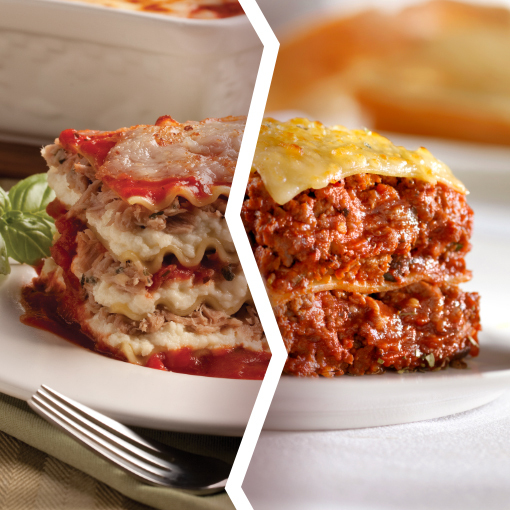 No other changes to the recipes were made so the comparison would be as accurate as possible. All nutritional analyses are completed using Genesis SQL Version 9.7.2. Tuna is the perfect substitute for ground beef in this dish! Preheat oven to 350 °F. Mix tuna with basil, oregano and garlic. Mix ricotta cheese, 1 cup mozzarella cheese, eggs and parmesan cheese and blend well. Cook lasagna noodles 3 at a time. Place 1 cup sauce in bottom of 13" x 9" pan. Place 3 lasagna noodles on top of sauce. Top with 1⁄3 cheese mixture. Top cheese with 1⁄2 tuna. Place 3 more noodles on top of tuna. Top with 1⁄3 cheese. Place 3 more noodles on top of cheese. Top with remaining cheese and tuna. Top with the last noodles and remaining pasta sauce. Cover with foil and bake in preheated oven for 30 minutes. Remove foil and cover with remaining 1⁄2 cup cheese and bake 10 minutes more.